To Cite: Shakarami S, Veisani Y, Kamali K, Mostafavi S, Mohammadi M R, et al. The Association Between Parents’ Lifestyles and Common Psychiatry Disorders in Children and Adolescents: A Population-Based Study, Shiraz E-Med J. 2019 ; 20(5):e81486. doi: 10.5812/semj.81486. Background: Family habits and the lifestyle of parents play an important role in the mental and social health of children. Objectives: Given the high prevalence of psychiatric disorders in Iran and the lack of information on the factors associated with these disorders, it is necessary to study the relationship between the lifestyle of parents with common psychiatric disorders in children and adolescents. Methods: The present analytical cross-sectional study was undertaken from 2016 to 2017. A total of 1,022 children and adolescents aged 6 - 18 in Ilam, Iran, were enrolled in the study. The participants were selected through multi-stage cluster sampling from urban and rural areas of the city. Data on children were collected by using a semi-structured interview with the Kiddie-SADS-Present and Lifetime Version (K-SADS-PL) Questionnaire, and the Life Style Questionnaire (LSQ). Using IBM-SPSS software V. 24, the chi-squared test, Student’s t-test, and multivariable logistic regression model were used to analyze the data. Results: There was a significant association between the mental health of parents with separation anxiety disorder (SAD) (adjusted odds ratio [aOR] = 0.86, P value [P] = 0.01). In addition, significant association was found between physical health (aOR = 1.17, P = 0.04), disease prevention (aOR = 1.22, P = 0.04), spiritual health (aOR = 0.83, P = 0.04), and avoidance of drugs, alcohol, and opiates (aOR = 0.87, P = 0.004) with obsessive-compulsive disorder. 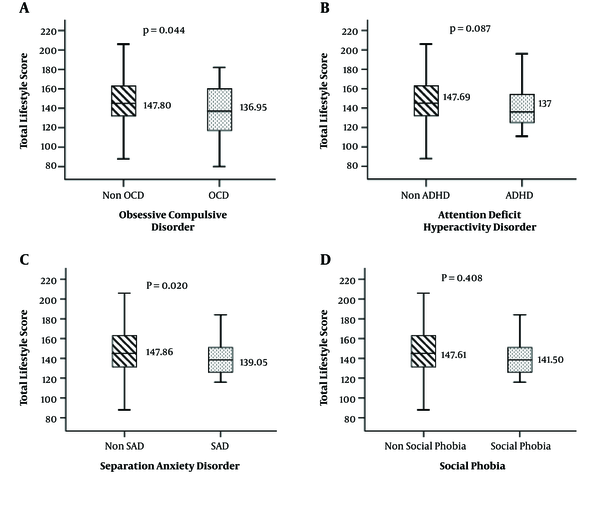 Attention deficit hyperactivity disorder with sports and fitness (aOR = 0.82, P = 0.01), social health (aOR = 1.33, P = 0.007), and social phobia with spiritual health (aOR = 0.76, P = 0.04) showed a statistically significant association. Conclusions: This study supports the hypothesis that the lifestyle of parents is an important determinant in the mental health of children. According to the World Health Organization (WHO), mental health is defined as a state of well-being in which every person realizes their own potential, can cope with the normal tensions of life, can work productively and fruitfully, and has the ability to make contributions to their community (1). Mental and psychiatric disorders prevent the effective role of individuals in developing their abilities in society. Given the fact that children and adolescents constitute a large part of the population of the country, and the advancement of any society requires the development of the talents and the ability of the human resources of that community, therefore children and adolescents are considered as potential future assets. Being so, they are also the vulnerable sectors of society and their physical and mental health is very important (2). Mental and psychiatric disorders are commonly seen for the first time in the early years of primary education, and then peak at the age of 8 to 15 years (3). Current studies have shown that 50% to 75% of psychiatric disorders begin in childhood and adolescence (4). Also, epidemiological studies have reported that the prevalence of psychiatric disorders among children and adolescents is higher than 20% while in adults it is over 50% (5). In different parts of the world, there are different reports on the prevalence of psychiatric disorders among children and adolescents. For example, the prevalence of psychiatric disorders in children and adolescents in Brazil ranged from 7 to 13% (6), in the Mexico City 15% (7), in Australia 14% (8), and in Bangladesh up to 15% (9). Similarly, the results of a study in Iran showed that approximately 17.9% of children aged 6 to 11 years suffer from mental disorders (10). In addition, mental and behavioral disorders in Iranian children are 20 to 40% higher than in children living in western countries (11). Considering the significant difference in the prevalence of psychiatric disorders in different parts of the world, it can be concluded that different factors affect the incidence rate/prevalence of these disorders in children and adolescents in different countries. The most important of these are age, gender, place of residence, socio-economic factors, health services, family socio-economic status, and people’s lifestyle (11). In addition, rapid changes in socio-cultural, political, and economic factors have an impact on the lifestyle of communities and families (12). Studies have shown that lifestyle plays a significant role in the incidence of mental disorders (13). Therefore, considering that the pedagogy and upbringing of children are largely carried out in the family context, so the lifestyle of parents is an effective factor which plays an important role in shaping their psychological, social, and cultural personality (13, 14). In fact, lifestyle is a recognizable pattern of behavior premised on the interaction between personality traits and lifestyle of a person. It also includes factors such as sleep and activity, exercise, proper weight management and nutrition, avoidance of smoking and alcohol, immunization against diseases, coping with stress, social support, and drug use (14, 15). Regarding the relationship between lifestyle and psychological disorders, various studies have been conducted in different countries. However, they have not specifically paid attention to the relationship between lifestyle dimensions of parents with psychiatric disorders in children and adolescents (14, 16). Children are modeled by their family atmosphere and re-produce their family’s behavior. Hence, their family and its lifestyle plays an important role in their mental and social health (17). Also, regarding an epidemiological transition in Ilam city, there is a hypothesis that different factors and problems such as poverty, deprivation, unemployment, and the effects of the war, along with the culture and specific behaviors of this city, can affect lifestyle and, consequently, the mental health of the residents of the city. Considering the high prevalence of psychiatric disorders in Ilam (18), as well as the lack of adequate information about the factors associated with these disorders, it is necessary to examine the relationship between parents’ lifestyle with common psychiatric disorders in children and adolescents in order to improve the health policies on youth in the country. Literate individuals read and signed informed consent, whereas verbal consent was obtained from illiterate patients. Ethical approval was obtained from the Ethical Committee of the Ilam University of Medical Sciences (IR.MEDILAM.REC.1397.96). The present analytical cross-sectional study was conducted on 1022 children and adolescents aged 6 to 18 years old by using a semi-structured interview with Kiddie-SADS-Present and Lifetime Version (K-SADS-PL). The Life Style Questionnaire (LSQ) was used to gather information for parents. Assuming the prevalence of psychiatric disorders to be 0.3 and type-1 error of 0.05, the sample size was estimated at 851 individuals. By considering the effect of cluster sampling equivalent 1.2, the final sample size was determined as 1002 people: This comprised 167 clusters (each cluster included 6 samples). To increase the power of the study we enrolled 1022 individuals. In addition to Ilam, the population of the suburbs was randomly sampled. In the next step, blocks were used for cluster sampling by using postal code: i.e., the samples were selected according to the postal code. Any citizen who had lived for at least one year in Ilam province could participate in the study with personal consent. The age range of children and adolescents included in the study was 6 to 18 years. Children and adolescents suffering from severe physical illnesses were excluded from the study. Data gathering tools consisted of two K-SADS-PL and LSQ questionnaires. The K-SADS-PL questionnaire is a semi-structured interview designed in order to find past and present episodes of mental illness in school-aged children and adolescents based on diagnostic and statistical manual of mental disorders (DSM-IV). This questionnaire is a Persian translated version of the Kiddie-SADS-Present and Lifetime Version for Schizophrenia and the mood of children and adolescents in the lifetime; its validity and reliability has been investigated. The K-SADS, Farsi version, is a semi-structured psychiatric interview, the reliability, validity, administrative characteristics, and uses of the K-SADS of which are reported by previous studies (19). There is sufficient validity and test-retest and inter-rater reliability and good to excellent sensitivity and specifity and positive and negative predictive validity for nearly all of the disorders (19). Test-retest reliability of attention deficit hyperactivity disorder (ADHD) is 0.81. Inter-rater reliability of ADHD is 0.69. The sensitivity and specificity of the Persian version of K-SADS-PL was very high (20). This questionnaire assesses diagnosis based on the fourth diagnostic manual of mental illnesses and its third edition revision. The K-SADS-PL questionnaire consists of three parts: In the first section, general information such as the demographic characteristics of the participants is covered. The second part includes screening related questions and benchmarking of psychiatric disorders. The third section is an overall assessment to determine the level of the child’s performance. The primary diagnosis of the K-SADS-PL questionnaire in this study included: Basic depression, simple phobia, separation anxiety disorder (SAD), obsessive compulsive disorder (OCD), enuresis, attention deficit hyperactivity disorder (ADHD), social phobia, generalized anxiety disorder (GAD), oppositional defiant disorder (ODD), and post-traumatic stress disorder (PTSD). Based on the results of Kaufman et al. it is apparent that the KSADS-PL questionnaire is able to identify children and adolescents’ psychiatric disorders (21). To complete the questionnaire, trained psychologists were interviewed by the K-SADS-PL semi-structured interview by referring to children’s homes. Questionnaires were completed for children under 15 years old by their parents and for ages 15 to 18 with questions by interviewer to teenagers. The time limit to complete the questions was about 30 to 40 minutes. The interview through above questionnaire started with demographic questions (age, gender, parental education, socio-economic status) along with information about the lifestyle of parents. Lifestyle questionnaire was taken from a study by Lali et al. with permission: In this study, validity with content validity, factors analysis and convergent validity, reliability with Cronbach’s alpha (0.76 - 0.89), and test-re-test was measured (0.84 - 0.94) (22). Its Cronbach’s alpha was considered to be 0.79% to 0.89% for different subscales. This questionnaire contained 70 questions which assessed the different dimensions of lifestyle in 10 dimensions [physical health (8 items), sports and fitness (7 items), weight management and nutrition (7 items), disease prevention (7 items), mental health (7 items), spiritual health (6 items), social health (7 items), avoidance of drugs, alcohol and opiates (6 items), accident prevention (8 items), and environmental health (7 items)]. Its scoring was based on the Likert 4 spectrum as always (3), usually (2), sometimes (1), and never (0). A higher score indicates better lifestyle (22). High scores in each one of the indicators and in the questionnaire indicated appropriate lifestyle in a way that lifestyle is “appropriate” if the obtained score is higher than 3 and is “inappropriate” if it is lower than 3. Data was entered into the IBM-SPSS software (version 22). Descriptive analysis and 95% CIs were used to determine the frequency of psychiatric disorders in children and adolescents and in the lifestyle of parents. Also, the difference in mean of total lifestyle with psychiatric disorders was achieved by using the independent t-test. Logistic regression model was used to investigate the association between the studied variables with psychological disorders. P value < 0.05 was considered as a significant association. According to the results of Table 1, the majority of participants were from the age group of 15 to 18 years: This was estimated in 165 boys (33.60) and 181 girls (34.10). Also, the highest proportion of participants was from urban areas, with 405 (82.50) for boys and 443 (83.40) for girls. According to the results of the study, 172 (16.80) fathers and 252 (24.70) mothers were illiterate or had an elementary school degree. Also, 507 (49.60) fathers had non-government job and 881 (86.20) mothers were housewives (Table 1). Table 2 shows the mean ± SD of the overall lifestyle score of parents according to different psychological disorders in children. Three depressive disorders, including separation anxiety and OCD disorder, showed a significant association with the overall lifestyle score. Compared to children without a disorder, the mean ± SD of parents’ lifestyle score 147.74 ± 23.13 was significantly different for those with depression disorder 124 ± 22.15, mean difference = 23.74 (95% CI: 7.63 - 39.84). Also, there was a significant difference between mean ± SD of lifestyle in children with SAD 139.05 ± 23.11 as compared to those without a disorder 147.86 ± 23.14, mean difference = 23.74 (95% CI: 1.39 - 16.22). In addition, the mean ± SD of parents’ lifestyle total lifestyle score (PTLS) in children with OCD 136.95 ± 28.17 was significantly higher than those without this disorder 147.80 ± 23.08, mean difference = 10.85 (95% CI: 0.31 - 21.38) (Table 2). Abbreviations: ADHD, attention deficit hyperactivity disorder; GAD, generalized anxiety disorder; OCD, obsessive compulsive disorder; ODD, oppositional defiant disorder; PTSD, post traumatic stress disorder; SAD, separation anxiety disorder; 95% CI, 95% confidence interval. Based on Figure 1A, the mean of PTLS for OCD individuals was higher than those without OCD: this difference was statistically significant (P = 0.04). Figure 1B shows that the mean of PTLS in people with ADHD was lower than those with no disorder, but this difference was not statistically significant (P = 0.08). Figure 1C depicts that the mean of PTLS in individuals without SAD was significantly higher than those with this disorder, which is statistically significant (P = 0.02). Finally, Figure 1D illustrates that the mean of PTLS in people without a social phobia disorder was higher than those with this disorder: This was not statistically significant (P = 0.40) (Figure 1). The results of multivariable logistic regression analysis show that there was a significant association between OCD and physical health. Based on the results of logistic regression, the average score of lifestyle in the physical health dimension in people without OCD was 17% less than those with a disorder (aOR = 1.17, 95% CI: 1.01 - 1.37, P = 0.04). Also, there was a direct and significant association between OCD and the disease prevention dimension (aOR = 1.22, 95% CI: 1.07 - 1.49, P = 0.04). In addition, our results indicate that the mean score of lifestyle in the dimension of spiritual health in people without OCD was 17% more than those with it (aOR = 0.83, 95% CI: 0.69 - 0.99, P = 0.04). There was also an inverse and significant association between avoidance of substances and drugs dimension with practical OCD (aOR = 0.87, 95% CI: 0.80 - 0.96, P = 0.004). According to Table 3, there was a significant association between ADHD and the dimensions of sport and fitness and social health. Based on these findings, the chances of ADHD decrease about 18% (aOR = 0.82, 95% CI: 0.70 - 0.96, P = 0.01) with increase in the mean of lifestyle score in the sport and fitness dimension. A direct and significant association was also found between the dimension of social health with ADHD (aOR = 1.33, 95% CI: 1.08 - 1.65, P = 0.007). Although our results indicate that, as a predictive variable, the chance of developing ADHD decreases (aOR= 0.83, 95% CI: 0.68 - 1.08) with increase in the mean score of the mental health dimension, this difference was not statistically significant. According to Table 3, there is a significant association between SAD and mental health. Based on the logistic regression results, the mean score of lifestyle in the mental health dimension of people was 13% higher in subjects with SAD than others without SAD (aOR = 0.86, 95% CI: 0.77 - 0.97, P = 0.01). In addition, the results showed a significantly inverse association between social phobia and spiritual health. By increasing the mean lifestyle score in spiritual health dimension, the chance of social phobia disorder decreases about 23% (aOR = 0.76, 95% CI: 0.59 - 0.99, P = 0.04). The aim of the present study was to investigate the relationship between lifestyle of parents with common psychiatric disorders in children and adolescents (in 2016). Based on multivariable logistic results and after adjusting the role of confounding variables, a significant direct association was found between parents’ physical health dimension with OCD in children. This finding was consistent with a study by Koran et al. (23) which showed that the physical health of people suffering from OCD was better than the anxiety group. However, this finding was in contrast with the results of the study by Witthauer et al. (24) which showed that physical diseases with specific disability have more links to OCD than obsessive compulsive symptoms (OCS). In order to justify the inconsistency with the previous study, we can point to the study population of these two studies: Witthauer et al. studied people in the age range of 18 to 65 years, while our study includes children aged 6 to 18 years. On the other hand, OCD is more psychological in nature: Hence the physical health of parents may not affect the mental health of their children (24). Based on the results, the disease prevention dimension had a direct and significant relationship with practical obsessive-compulsive disorder in children. In a study conducted in the general population and diabetes groups of the United States, the quality of life (which is also an important tool for effectiveness of roles and social function) in patients with obsessive-compulsive disorder is in a worse situation as compared to those who have chronic noncontagious diseases. However, in that study, the statistical population of the people was 40 years and older, and only the quality of life of two groups of society was compared: The study of lifestyle dimensions and the impact of obsessive-compulsive disorder had not been addressed in this research (24). Literature has suggested that OCD and ADHD may have a physiological nature which means that their relationship with the physical health of parents can be explained by common genetic bases of some different disorders. Also, Taylor et al, have shown an association between OCD with genetic and environmental factors (25). Also, there was a significant relationship between parents’ spiritual health with OCD in children. In other words, with increase in spiritual health of parents, the rate of this disorder decreases in children. Other studies also reported that people with practical obsessive-compulsive disorder were more religious in comparison to other patients: i.e., people with higher degrees of religiosity were more likely to have this disorder than those with lower degrees of religiosity (26, 27). A 28-years old study, with participation of 5286 adults (aged 21 - 65 years), showed that people who had frequent visits (more than once a week) to religious services had a higher life and longevity as compared to absence (28). Individuals of some religious groups may have unrealistic expectations of themselves, which leads to isolation, stress, and anxiety; or they may feel alienated with those who do not believe in their belief. Finally, it is well-known that unhealthy belief systems can negatively affect health (29). In interpreting some contradictory results of these studies, it should be remembered that research has actually been done about different concepts in different populations in terms of beliefs and practices by using different tools (30). In addition, the results show that with the increase in the mean of avoidance of drugs in parents, the level of obsessive-compulsive disorder significantly decreases in children. This finding is consistent with the results of studies that report decrease in the level of psychological disorders by increasing the life level (31, 32). Also, another study by Suzuki et al. showed that there is a significant and inverse relation between lifestyle and psychological disorders (33). However, in the above studies, only the general lifestyle and its relationship with psychological disorders are discussed and there are no references to lifestyle factors. The association between depression and different dimensions of lifestyle has been reported in previous studies. For instance, in Demura and Sato study, there was a direct correlation between depression and sports and fitness (34). In another study, smoking and alcohol were factors affecting the development of depression in women (35). Also, a number of previous studies have shown that physical activity has an effective role on depression (36, 37). In addition, in Japan it has been reported that healthy lifestyles can prevent depression in the elderly, as well as the relationship between smoking, overweightness and inappropriate sleep, may be increase the risk of depression and memory loss (35, 38). However, in our study, depression disorder was significant only with total lifestyle score (Table 2) and no significant association was found between depression with different dimensions of lifestyle. Also, in a study by Haffner et al. significant relationship between attention deficit/hyperactivity disorder and sports and fitness was found (39). According to the results of this study, a positive and meaningful relationship was found between this disorder and the sport and fitness dimension as part of the lifestyle of parents. This finding matches with Gapin and Etnier who investigated the effect of 20 sessions of yoga exercises on children aged 8 to 13 years and found that exercise therapy improves disorder in children with ADHD (40). Additionally, there is much evidence which mainly consider ADHD as a genetic and neurological disorder (41-43), but this cannot diminish the importance of family role in the management of their children behavior. Also, according to the results of the study, by increasing the average of social health of parents, hyperactivity disorder increases in children. However, the results of a study showed that children with ADHD had lower levels of social skills and lower self-esteem than the general population (44): This could be due to cultural differences as well as the age of the study population. There are studies which do not support the above hypothesis, i.e. children with ADHD have higher self-esteem than children without ADHD, but interpersonal relationships are weaker than in other children (45). However, the above studies only investigated hyperactivity disorder and its association with self-esteem and social skills in children and did not measure the impact of social health of parents on the level of this disorder. There was a meaningful and inverse relationship between the mental health of parents and SAD in children. The results of this finding are consistent with the study by Chang et al. which state that mental health of mother is effects behavioral and anxiety disorders in children (46). It is also consistent with the results of Guethmundsson and Tomasson (47) and Foley et al. (48). According to these researches, it can be concluded that children are among the groups at risk of mental illness and that one of the reasons for children being affected by mental disorders is their interaction with their parents, especially with diseased parents (49, 50). In addition, there seems to be a significant and inverse relationship between parents’ spiritual health and children’s social phobia: by increasing parents’ spiritual Health, social phobia in children decreases. In a study done in Germany on people aged 18 - 60 with the aim of inability and quality of pure life with social phobia, it was found that social phobia in adults leads to mental suffering and has a negative impact on work as well as individual performance. In other words, the quality of life of people with social phobia is at a lower level than those without this disorder (51). However, this study focusses only on the general dimension of lifestyle and social phobia disorder. The data from this study provides a basis that can be useful for the country’s ongoing services. This study has the following strengths: To the best of our knowledge, no previous study has examined the association between different aspects of parents’ lifestyle on their children’s mental disorders. Also, we included respondents from city and countryside: This helped us obtain generalizable findings. However, one of the limitations of our study is that because of lack of information, mental disorders were not assessed in parents. The honesty of respondents to the questionnaires cannot be determined. Similarly, their prejudices may have determined their responses to the diagnosis of these mental disorders. However, these problems are inevitable in such studies. Also, the high number of questions in both questionnaires may reduce the willingness of the subjects to respond, which may lead to the possibility of subjects leaving the study due to incomplete information. This study approved results of previous studies, i.e. that parents’ lifestyle is an important determinant in children’s mental health. According to our results, the risk of mental disorders in children whose parents have a lower lifestyle score in some dimensions such as mental health and spiritual is higher than others. Therefore, it can be inferred that some aspects of parents’ lifestyle may reflect the status of mental health in their children. This way we have a great appreciation to The National Institute of Medical Research Development (NIMAD), with (the IR.NIMAD.REC.1395.001 Ethical Code) (Grant Number: 940906), and the Psychiatry and Psychological Research Center of the Tehran University of Medical Sciences, that sponsored this project financially and spiritually. Authors' Contribution: Saba Shakarami contributed to the design and implementation of the study, analysis and interpretation of data and was involved in drafting the manuscript. Fathola Mohamadian and Mohammad Reza Mohammadi contributed to the design and implementation of the study, interpretation of data and was involved in drafting and revising the manuscript. Nastaran Ahmadi contributed to the conception and design of data and drafting the manuscript. Seyed-Ali Mostafavi and Koorosh Kamali contributed to the design and implementation of the study and was involved in drafting and revising the paper. Yousef Veisani and Mohammad Fararouei contributed to the conception and design of data and drafting the manuscript. Ali Delpisheh and Mohammad Fararouei contributed to the analysis and interpretation of data and was involved in revising the manuscript. All authors reviewed and approved the final version to be published. Conflict of Intrests: None declared. 1. World Health Organization. Promoting mental health: Concepts, emerging evidence, practice: Summary report. Geneva: World Health Organization; 2004. 2. Huaqing Qi C, Kaiser AP. Behavior problems of preschool children from low-income families: Review of the literature. Top Early Child Special Educ. 2003;23(4):188-216. doi: 10.1177/02711214030230040201. 3. World Health Organization. The world healt report: 2003: Shaping the future. World Health Organization; 2003. 4. Kessler RC, Berglund P, Demler O, Jin R, Merikangas KR, Walters EE. Lifetime prevalence and age-of-onset distributions of DSM-IV disorders in the National Comorbidity Survey Replication. Arch Gen Psychiatry. 2005;62(6):593-602. doi: 10.1001/archpsyc.62.6.593. [PubMed: 15939837]. 5. Haghighatdoost F, Kelishadi R, Qorbani M, Heshmat R, Motlagh ME, Ardalan G, et al. Family dinner frequency is inversely related to mental disorders and obesity in adolescents: The CASPIAN-III study. Arch Iran Med. 2017;20(4):218-23. [PubMed: 28412825]. 6. Goodman R, Neves dos Santos D, Robatto Nunes AP, Pereira de Miranda D, Fleitlich-Bilyk B, Almeida Filho N. The Ilha de Mare study: A survey of child mental health problems in a predominantly African-Brazilian rural community. Soc Psychiatry Psychiatr Epidemiol. 2005;40(1):11-7. doi: 10.1007/s00127-005-0851-z. [PubMed: 15624069]. 7. Benjet C, Borges G, Medina-Mora ME, Zambrano J, Aguilar-Gaxiola S. Youth mental health in a populous city of the developing world: Results from the Mexican Adolescent Mental Health Survey. J Child Psychol Psychiatry. 2009;50(4):386-95. doi: 10.1111/j.1469-7610.2008.01962.x. [PubMed: 19040499]. 8. Sawyer MG, Arney FM, Baghurst PA, Clark JJ, Graetz BW, Kosky RJ, et al. The mental health of young people in Australia: Key findings from the child and adolescent component of the national survey of mental health and well-being. Aust N Z J Psychiatry. 2001;35(6):806-14. doi: 10.1046/j.1440-1614.2001.00964.x. [PubMed: 11990891]. 9. Mullick MS, Goodman R. The prevalence of psychiatric disorders among 5-10 year olds in rural, urban and slum areas in Bangladesh: An exploratory study. Soc Psychiatry Psychiatr Epidemiol. 2005;40(8):663-71. doi: 10.1007/s00127-005-0939-5. [PubMed: 16091858]. 10. Alavi A, Mohammadi MR, Joshaghani N, Mahmoudi-Gharaei J. Frequency of psychological disorders amongst children in urban areas of Tehran. Iran J Psychiatry. 2010;5(2):55-9. [PubMed: 22952492]. [PubMed Central: PMC3430495]. 11. Mohammadi MR, Ahmadi N, Kamali K, Khaleghi A, Ahmadi A. Epidemiology of psychiatric disorders in Iranian children and adolescents (IRCAP) and its relationship with social capital, life style and parents' personality disorders: Study protocol. Iran J Psychiatry. 2017;12(1):66-72. [PubMed: 28496504]. [PubMed Central: PMC5425354]. 12. Meltzer H, Gatward R, Goodman R, Ford T. Mental health of children and adolescents in Great Britain. Int Rev Psychiatry. 2003;15(1-2):185-7. doi: 10.1080/0954026021000046155. [PubMed: 12745331]. 13. Heikkala E, Remes J, Paananen M, Taimela S, Auvinen J, Karppinen J. Accumulation of lifestyle and psychosocial problems and persistence of adverse lifestyle over two-year follow-up among Finnish adolescents. BMC Public Health. 2014;14:542. doi: 10.1186/1471-2458-14-542. [PubMed: 24884444]. [PubMed Central: PMC4057560]. 14. Rao S, Shah N, Jawed N, Inam S, Shafique K. Nutritional and lifestyle risk behaviors and their association with mental health and violence among Pakistani adolescents: Results from the National Survey of 4583 individuals. BMC Public Health. 2015;15:431. doi: 10.1186/s12889-015-1762-x. [PubMed: 25927931]. [PubMed Central: PMC4416240]. 15. Lavigne JV, Gibbons RD, Christoffel KK, Arend R, Rosenbaum D, Binns H, et al. Prevalence rates and correlates of psychiatric disorders among preschool children. J Am Acad Child Adolesc Psychiatry. 1996;35(2):204-14. doi: 10.1097/00004583-199602000-00014. [PubMed: 8720630]. 16. Concepcion T, Barbosa C, Velez JC, Pepper M, Andrade A, Gelaye B, et al. Daytime sleepiness, poor sleep quality, eveningness chronotype, and common mental disorders among Chilean college students. J Am Coll Health. 2014;62(7):441-8. doi: 10.1080/07448481.2014.917652. [PubMed: 24810953]. [PubMed Central: PMC4207264]. 17. Burton P, Phipps S, Curtis L. All in the family: A simultaneous model of parenting style and child conduct. Am Econ Rev. 2002;92(2):368-72. doi: 10.1257/000282802320191633. 18. Veisani Y, Mohamadian F, Delpisheh A. Prevalence and comorbidity of common mental disorders and associations with suicidal ideation in the adult population. Epidemiol Health. 2017;39. e2017031. doi: 10.4178/epih.e2017031. [PubMed: 28774163]. [PubMed Central: PMC5675985]. 19. Ghanizadeh A, Mohammadi MR, Yazdanshenas A. Psychometric properties of the Farsi translation of the Kiddie schedule for affective disorders and schizophrenia-present and lifetime version. BMC Psychiatry. 2006;6:10. doi: 10.1186/1471-244X-6-10. [PubMed: 16539703]. [PubMed Central: PMC1484478]. 20. Ghanizadeh A. ADHD, bruxism and psychiatric disorders: Does bruxism increase the chance of a comorbid psychiatric disorder in children with ADHD and their parents? Sleep Breath. 2008;12(4):375-80. doi: 10.1007/s11325-008-0183-9. [PubMed: 18421490]. 21. Kaufman J, Birmaher B, Brent D, Rao U, Flynn C, Moreci P, et al. Schedule for affective disorders and schizophrenia for school-age children-present and lifetime version (K-SADS-PL): Initial reliability and validity data. J Am Acad Child Adolesc Psychiatry. 1997;36(7):980-8. doi: 10.1097/00004583-199707000-00021. [PubMed: 9204677]. 22. Lali M, Abedi A, Kajbaf MB. [Construction and validation of the lifestyle questionnaire (LSQ)]. Psychol Res. 2012;15(1):64-80. Persian. 23. Koran LM, Thienemann ML, Davenport R. Quality of life for patients with obsessive-compulsive disorder. Am J Psychiatry. 1996;153(6):783-8. doi: 10.1176/ajp.153.6.783. [PubMed: 8633690]. 24. Witthauer C, T. Gloster A , Meyer AH, Lieb R. Physical diseases among persons with obsessive compulsive symptoms and disorder: A general population study. Soc Psychiatry Psychiatr Epidemiol. 2014;49(12):2013-22. doi: 10.1007/s00127-014-0895-z. [PubMed: 24907897]. [PubMed Central: PMC4228109]. 25. Taylor S, Jang KL, Asmundson GJ. Etiology of obsessions and compulsions: A behavioral-genetic analysis. J Abnorm Psychol. 2010;119(4):672-82. doi: 10.1037/a0021132. [PubMed: 21090873]. 26. Abramowitz JS, Deacon BJ, Woods CM, Tolin DF. Association between Protestant religiosity and obsessive-compulsive symptoms and cognitions. Depress Anxiety. 2004;20(2):70-6. doi: 10.1002/da.20021. [PubMed: 15390213]. 27. Nelson EA, Abramowitz JS, Whiteside SP, Deacon BJ. Scrupulosity in patients with obsessive-compulsive disorder: Relationship to clinical and cognitive phenomena. J Anxiety Disord. 2006;20(8):1071-86. doi: 10.1016/j.janxdis.2006.02.001. [PubMed: 16524696]. 28. Strawbridge WJ, Cohen RD, Shema SJ, Kaplan GA. Frequent attendance at religious services and mortality over 28 years. Am J Public Health. 1997;87(6):957-61. doi: 10.2105/AJPH.87.6.957. [PubMed: 9224176]. [PubMed Central: PMC1380930]. 29. Koenig HG, Larson DB, Larson SS. Religion and coping with serious medical illness. Ann Pharmacother. 2001;35(3):352-9. doi: 10.1345/aph.10215. [PubMed: 11261534]. 30. Omidvari S, Shahidzadeh A, Montazeri A, Azin SA, Harir Chi AM, Souri H, et al. [Patient satisfaction with emergency departments]. Payesh. 2008;7(2):141-52. Persian. 31. Matud MP, Camacho J, Hernández JA, Marrero RJ, Carballeira M, López M. Stress and health in Spanish women. J Appl Soc Psychol. 2004;34(4):731-46. doi: 10.1111/j.1559-1816.2004.tb02567.x. 32. Suwazono Y, Okubo Y, Kobayashi E, Kido T, Nogawa K. A follow-up study on the association of working conditions and lifestyles with the development of (perceived) mental symptoms in workers of a telecommunication enterprise. Occup Med (Lond). 2003;53(7):436-42. doi: 10.1093/occmed/kqg102. [PubMed: 14581640]. 33. Suzuki K, Kitaike T, Miyazaki Y, Nojiri M. [Factors related to the mental health of workers dispatched to foreign countries]. Sangyo Eiseigaku Zasshi. 2003;45(3):105-13. Japanese. doi: 10.1539/sangyoeisei.45.105. [PubMed: 12833852]. 34. Demura S, Sato S. Relationships between depression, lifestyle and quality of life in the community dwelling elderly: A comparison between gender and age groups. J Physiol Anthropol Appl Human Sci. 2003;22(3):159-66. doi: 10.2114/jpa.22.159. [PubMed: 12808229]. 35. Tanaka H, Sasazawa Y, Suzuki S, Nakazawa M, Koyama H. Health status and lifestyle factors as predictors of depression in middle-aged and elderly Japanese adults: A seven-year follow-up of the Komo-Ise cohort study. BMC Psychiatry. 2011;11:20. doi: 10.1186/1471-244X-11-20. [PubMed: 21294921]. [PubMed Central: PMC3041738]. 36. Strawbridge WJ, Deleger S, Roberts RE, Kaplan GA. Physical activity reduces the risk of subsequent depression for older adults. Am J Epidemiol. 2002;156(4):328-34. doi: 10.1093/aje/kwf047. [PubMed: 12181102]. 37. Camacho TC, Roberts RE, Lazarus NB, Kaplan GA, Cohen RD. Physical activity and depression: Evidence from the Alameda County Study. Am J Epidemiol. 1991;134(2):220-31. doi: 10.1093/oxfordjournals.aje.a116074. [PubMed: 1862805]. 38. Aihara Y, Minai J, Aoyama A, Shimanouchi S. Depressive symptoms and past lifestyle among Japanese elderly people. Community Ment Health J. 2011;47(2):186-93. doi: 10.1007/s10597-010-9317-1. [PubMed: 20455023]. 39. Haffner J, Roos J, Goldstein N, Parzer P, Resch F. [The effectiveness of body-oriented methods of therapy in the treatment of attention-deficit hyperactivity disorder (ADHD): Results of a controlled pilot study]. Z Kinder Jugendpsychiatr Psychother. 2006;34(1):37-47. German. doi: 10.1024/1422-4917.34.1.37. [PubMed: 16485612]. 40. Gapin J, Etnier JL. The relationship between physical activity and executive function performance in children with attention-deficit hyperactivity disorder. J Sport Exerc Psychol. 2010;32(6):753-63. doi: 10.1123/jsep.32.6.753. [PubMed: 21282836]. 41. Coolidge FL, Thede LL, Young SE. Heritability and the comorbidity of attention deficit hyperactivity disorder with behavioral disorders and executive function deficits: A preliminary investigation. Dev Neuropsychol. 2000;17(3):273-87. doi: 10.1207/S15326942DN1703_1. [PubMed: 11056845]. 42. Sergeant JA, Geurts H, Huijbregts S, Scheres A, Oosterlaan J. The top and the bottom of ADHD: A neuropsychological perspective. Neurosci Biobehav Rev. 2003;27(7):583-92. doi: 10.1016/j.neubiorev.2003.08.004. [PubMed: 14624803]. 43. Soliva JC, Fauquet J, Bielsa A, Rovira M, Carmona S, Ramos-Quiroga JA, et al. Quantitative MR analysis of caudate abnormalities in pediatric ADHD: Proposal for a diagnostic test. Psychiatry Res. 2010;182(3):238-43. doi: 10.1016/j.pscychresns.2010.01.013. [PubMed: 20488672]. 44. Bussing R, Zima BT, Perwien AR. Self-esteem in special education children with ADHD: Relationship to disorder characteristics and medication use. J Am Acad Child Adolesc Psychiatry. 2000;39(10):1260-9. doi: 10.1097/00004583-200010000-00013. [PubMed: 11026180]. 45. Oshodin UA. The impact of attention-deficit/hyperactive disorder on interpersonal relationships and self-esteem. University of Limpopo; 2016. 46. Chang JJ, Halpern CT, Kaufman JS. Maternal depressive symptoms, father's involvement, and the trajectories of child problem behaviors in a US national sample. Arch Pediatr Adolesc Med. 2007;161(7):697-703. doi: 10.1001/archpedi.161.7.697. [PubMed: 17606834]. 47. Guethmundsson OO, Tomasson K. Quality of life and mental health of parents of children with mental health problems. Nord J Psychiatry. 2002;56(6):413-7. doi: 10.1080/08039480260389325. [PubMed: 12495535]. 48. Foley DL, Pickles A, Simonoff E, Maes HH, Silberg JL, Hewitt JK, et al. Parental concordance and comorbidity for psychiatric disorder and associate risks for current psychiatric symptoms and disorders in a community sample of juvenile twins. J Child Psychol Psychiatry. 2001;42(3):381-94. doi: 10.1111/1469-7610.00731. [PubMed: 11321207]. 49. Hall LA, Williams CA, Greenberg RS. Supports, stressors, and depressive symptoms in low-income mothers of young children. Am J Public Health. 1985;75(5):518-22. doi: 10.2105/AJPH.75.5.518. [PubMed: 3985241]. [PubMed Central: PMC1646274]. 50. Lovejoy MC, Graczyk PA, O'Hare E, Neuman G. Maternal depression and parenting behavior: A meta-analytic review. Clin Psychol Rev. 2000;20(5):561-92. doi: 10.1016/S0272-7358(98)00100-7. [PubMed: 10860167]. 51. Wittchen HU, Fuetsch M, Sonntag H, Muller N, Liebowitz M. Disability and quality of life in pure and comorbid social phobia. Findings from a controlled study. Eur Psychiatry. 2000;15(1):46-58. doi: 10.1016/S0924-9338(00)00211-X. [PubMed: 10713802].